The CAT is nearly a perfect animal, it’s inexpensive to acquire, looks good, comes in many breeds and colour varieties, functions precisely, owes nothing to anyone, gives much and demands little in return. Although the cat and the dog are both carnivores, the cat has a sense of curiosity that is boundless and their hunting instincts are precise and predatory like. Purchase a harness and teach your cat to walk on a leash – leash walking is no longer for dogs only, your smart feline might be slightly perplexed to have a harness placed on them in the first few instances, however if you persevere with the use of rewards (i.e. food, toys), it will give you both a chance to explore the great outdoors in a safe manner. Once they mastered leash walking, you can take them travelling in the car as long as they don’t display anxiety symptoms. Training – cats can be trained to perform many tricks, however unlike dogs, they don’t take kindly to coercion or rewarding by petting. Some cats are food driven and can even be clicker trained. Once you figure out their most desirable treat (i.e. diced chicken as long as they don’t have allergies or health conditions) start with short sessions few minutes each day, most important is make it a FUN experience. Target training, as displayed in this tutorial with Dr. Sophia Yin https://drsophiayin.com/videos/entry/target_training_kittens is also a wonderful way to start your kitty with techniques that can be developed upon. Brush your cat – long-haired cats need daily brushing otherwise their coats will mat. A short-haired cat can be groomed once or twice per week with either a fine-toothed metal comb or soft natural bristle brush. Start from the head all the way to its tail. Brushing will also prevent accumulation of fur balls within their stomach. Play interactive games – your cat is highly intelligent, it can work out answers to problems, apply them and then adapt solutions to different situations. Multifunction / interactive toys provide a variety of mental stimulation, they are fun and ideal for promoting independent play and exercise as well as enhance the cats natural hunting characteristics. Make a house out of an empty cardboard box – cats love boxes and paper bags. Build an indoor cat playground by utilising empty boxes and paper bags. Your kitty will be entertained for ages and most likely fall asleep in the box afterwards (it’s also a great hiding spot). Nose work – a cat has around 19 million nerve endings in their nose while humans get by with five million. The cat’s nose is extremely sensitive to scents that contain nitrogen compounds and they also have a vomeronasal organ aka Jacobson’s organ that detects pheromones. Nose work or scent detection is a great way to teach your feline friend to use its nose to find treats. Start by hiding food in boxes and progress to teaching them to find it around furniture. Massage your cat – massaging the coat by stroking it along the fibres of the hair will benefit your cat in countless ways. 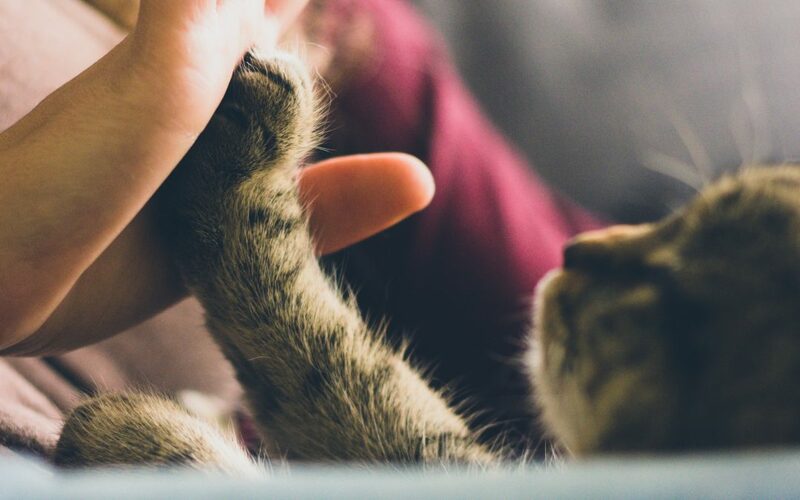 Massage strengthens the immune system, relieves stress and anxiety, transmits the psychological benefits of touch to your feline and improves emotional well-being. Overtime this can lead to reduction in muscle soreness and ease pain. Taylor, D. (1987). You & Your Cat. Surry Hills, NSW, Australia: R.D. Press.